Google+ started supporting hashtags in May, and today the company announced that Google Search will now allow you to search for Google+ posts by using these hashtags. Given that there’s a little bit of Google+ in every Google product now, it’s no surprise that these Google+ hashtags are now finding their way into other Google products. This new search feature is now live for English language users in the U.S. and Canada on google.com and google.ca. 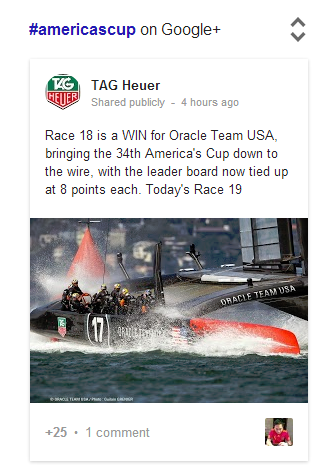 In Google Search, users will now be able to search for hashtags like #AmericasCup and get a list of relevant Google+ posts in the right sidebar. 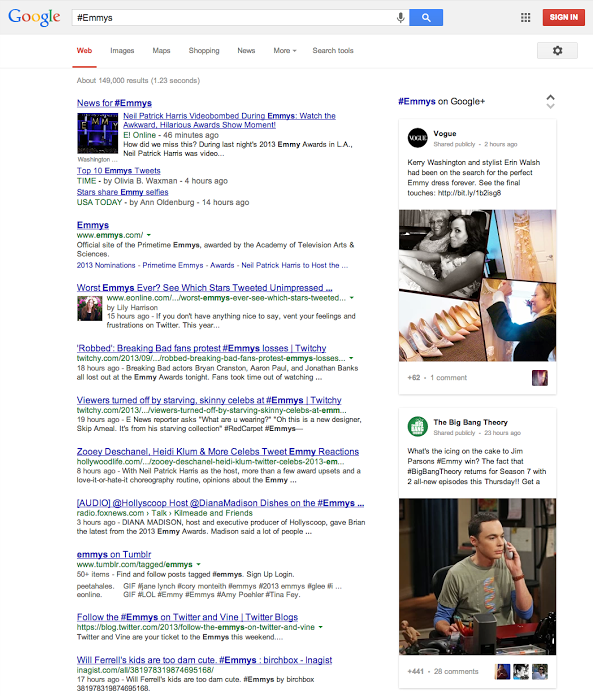 Google won’t highlight posts from Twitter or Facebook in the sidebar, but it has put links to Twitter and Facebook right underneath the Google+ posts so users can search for these terms on those social networks, as well. The links in these Google+ posts are all active and you can see how many +1s and comments a given post received. You can’t, however, interact with the post right on the search results page as there is no way to follow, +1 or comment on these search results without going to Google+ first. It remains to be seen how popular this feature will be. Most users, I think, would probably prefer to see this feature work for Twitter hashtags. It’s doubtful that all that many Google users were clamoring for a better way to search for Google+ hashtags on Google Search, but maybe this will give this feature a bit more visibility. For content owners, however, this feature definitely gives them an incentive to use hashtags in their Google+ posts (and to use Google+ in the first place). The top-right corner of the search results page, after all, is prime real estate, and getting your link to show up there could drive significant traffic for popular hashtags.